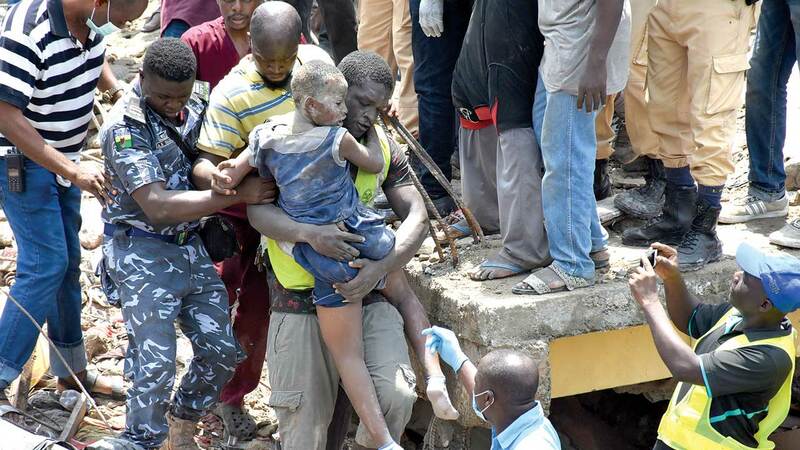 Twenty people have been confirmed dead in the collapse of a building housing a nursery and primary school in Nigeria’s biggest city, Lagos, the authorities said on Friday. The dilapidated building in the densely populated Lagos Island area of the city came down without warning on Wednesday morning. Rescue workers called off the search for survivors on Thursday, with the death toll at nine and the number of injured who were taken to hospital at 37. But Lagos State health commissioner Jide Idris said the final toll was now higher. “Twenty people were killed and 45 people were treated in different hospitals,” he told AFP by telephone. He did not give a breakdown but said the dead included children. Many of the injured who were pulled from the rubble had now been discharged. “About 15” were still in hospital in a stable condition, he said. One was described as “serious” and required surgery, he added. Lagos governor Akinwunmi Ambode has said the school was operating illegally in the building and pledged to shut down similar establishments throughout the state. He has promised a full investigation into the tragedy and warned those responsible they would be “severely dealt with”. The updated death toll came as bulldozers moved in to the area around the collapse to begin tearing down poorly-maintained and dangerous buildings. Omotayo Fakolujo, from the Lagos State Building and Control Agency (LASBCA), said about 100 distressed buildings had been earmarked for demolition. But local residents and business owners were outraged at the move, as they said they had been given little or no notice to vacate their premises and had nowhere else to go. “They came about 12:00 pm (1100 GMT) and they (LASBCA) didn’t warn anyone,” said Toheeb Olasupo, a 25-year-old computer analyst. Building collapses are tragically common in Lagos and elsewhere in Nigeria, because of the use of sub-standard materials and the non-enforcement of building regulations. Two manslaughter prosecutions are currently being held in Lagos state after scores of people were killed in two separate building collapses in 2015 and 2016. In one, 116 people were killed, most of them South Africans, when a guesthouse collapsed at the Lagos church complex of celebrity televangelist TB Joshua. On Lagos Island, many buildings are poorly maintained and have had floors added without any apparent strengthening of the structure or foundations, making them ripe for collapse. An AFP reporter on the ground said scores of tenants had been displaced as the demolition began of at least three buildings in the area. LASBCA’s Fakolujo told reporters most of the buildings had been the subject of long-running court cases, which meant they could not demolished. One shop owner said she had only just paid a year’s rent of 72,000 naira ($200, 175 euros) upfront when she was told the building was to be knocked down. Oluwasina Aina, who lives on the second floor of one of the affected buildings with his wife and their two children, aged 12 and six, said he was asleep when he heard loud banging. He looked out of the window and saw officials smashing the walls of homes with hammers and using an electric saw to break through window security bars. “I live here, me and my family,” he said, with tears in his eyes. “I just rented this place in January, barely three months ago. I did not know anything was wrong with the building. My children will come back now and see, my wife is not home. “As you see now my belongings are still inside… We cannot stay there tonight, we will find somewhere else. If they are doing this they should help us.